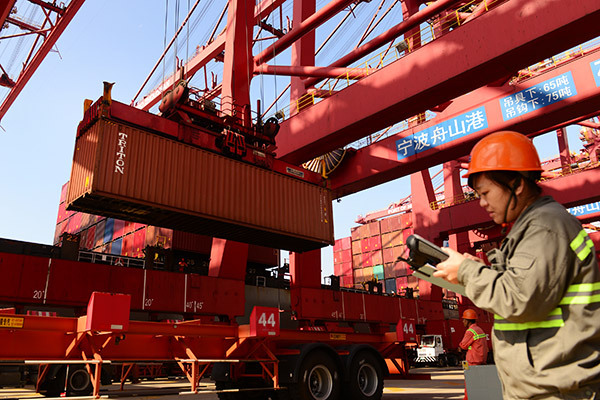 China's gross domestic product expanded at a rate of 6.9 percent in the first half of this year. In a series of interviews, China Daily asked economists, analysts and business leaders about the prospects for economic growth in the country. Below is an interview with Xu Hongcai, an economist with the China Center for International Economic Exchanges. Q: What were the most encouraging signs in the Chinese economy in the first half of 2017? What impressed you most about the macroeconomic data currently available for the first half of this year? A: There are a couple of indicators reflecting economic recovery. For instance, China's industrial output, a significant economic indicator, witnessed gradual recovery since the beginning of this year. Consumption remained a key driver. Retail sales rose 11 percent in June from a year earlier, the fastest growth pace since December 2015. Q: Based on your research or business operations, what are your comments and projections regarding the Chinese economy's growth prospects in the second half of this year? A: We expect the economic growth rate will not be lower than 6.7 percent this year. The domestic economy has passed its toughest moment as a number of recovery signs have appeared. Investment in infrastructure construction will continue to spur the economy, and consumption will continue to support the stabilizing trend. Q: What will be the most supportive factors bolstering China's growth this year? What are the most severe challenges currently facing the Chinese economy? A: Balanced budget fiscal expansion is expected to support the stable trend. In the meantime, efforts to fend off risks involved in interbank activities and shadow banking mean the non-financial sector is expected to benefit from the process, as more liquidity is expected to flow to support economic activities. Q: What are your suggestions regarding how China can achieve stable, balanced, and sustainable economic growth in the years ahead? A: China needs to continue to implement supply-side reform. The liquidity needs to remain at a proper level and should not be too tight in order to sustain growth. China should prudently manage the country's debt deleveraging process.